Add your name; we’ll periodically send updates to the Deciders on the Hill!! 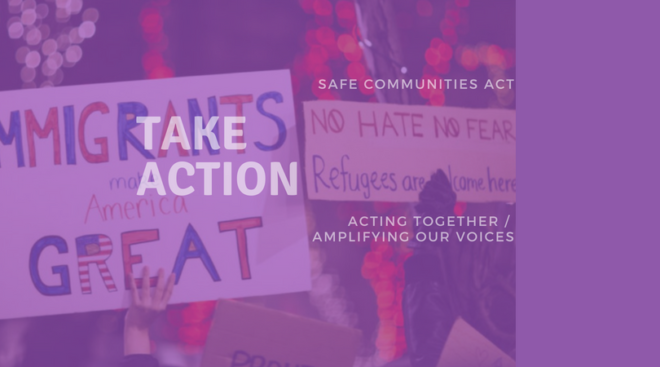 Download the sign-on letter and email it to DeLeo, Sanchez, Baker and YOUR rep, –or just reference the “Safe Communities Coalition Letter from June 13”– and say You support the letter, you support keeping families together, community safety, and it’s time to pass the Safe Communities Act. Need a Short Recap? Though the SCA bill has been stalled in “study”, advocates with your support have pushed central key provisions to passage via the budget. The fate of these SCA provisions lies in the hands of the Budget Conference Committee–and, really, in the hands of the House Chair, Jeffrey Sanchez, and really, Speaker DeLeo. Here’s a secret: Though you will routinely hear from legislators and hard-boiled advocates that it’s up to the Speaker, with the defeated conclusion that ‘it’s no use talking to your own rep, because it’s really up to the Speaker/leadership’…. …. Leadership actually does care if all of a sudden the rank and file members start feeling more scared of NOT doing the right thing, than they are of the blowback from Trumpians for doing the right thing. The key? Persistent, uncompromising outreach. Called? Call again. Say your’e wondering what they’ve done lately to push Leadership. Ask for receipts! join us on WEDNESDAY: Keep Families Together rally at the State House to deliver the letters! 11:00 We’ll enter the State House together. Forcibly separating children is a crime against humanity. Not only does it permanently traumatize children and their parents, it can lead to chronic mental illness, including permanent distrust, anger, and even violence towards government institutions and people in general. Joe is absolutely right! It is a despicable action that one would expect to find in a fascist state, We must stop this crime being committed in our name. I’m a veteran, a former naval intelligence officer. This is such an anathema to the values I thought we were trying to protect. If separating babies from their mothers and fathers isn’t a crime against humanity, what is? Hopefully this will be the last moral outrage that will wake up legislators and move them to pass a humane-law that protects vulnerable refugees who are fleeing to the US from countries where their lives and the lives of their families are threatened.